Done up in all its lights you can see London's Oxford Street when you approach London from the air, assuming your flight path allows for it. If you have a window seat, you may not only be able to differentiate the colour of the lights on each building you may also be able to see something of the architecture. In which case the most stylish building on the street is Selfridges. If you can only see colour then it's the yellow one. For that particular shade of bold, vibrant yellow is now synonymous with the store. Bright yellow may seem like an odd choice for a store with this sort of history and distinction – the flagship Oxford Street store mentioned above was opened in 1909, it was also where the plane from the first cross Channel flight was displayed, and where the first public demonstration of television took place in 1925. But key to its history is that it was the first place in the world where fun was considered a key part of the shopping experience. Oh how Mr. H. Gordon Selfridge was right! This was the first store where items were put on display in a way that customers could examine them themselves and the first store where the perfume department filled the entrance hall – this was also the first store to use the phrase 'the customer is always right' in their advertising. So shopping at Selfridges is about appreciating the whole history of the department store as well as just about shopping – if you needed any further help justifying any future expeditions into its great pillared halls (which are considered architectural sites in their own right.). Ground Floor: Tiffanys gems and trinkets, products to make you smell divine, handbags you have to queue to shop for, very reasonably priced fine wines and spirits, clothes for young ladies, edible treats and stationary. Basement: Best of British gift and designware, the Christmas store, rows of neat, sharp silver kitchen utensils, inviting tableware, matched and unmatched luggage, books and home cinema systems and other technological wonders. First Floor: Shoes for DAYS, dashing duds and accessories for smart gents and not so smart gents and a bar serving an excellent choice of drinks to steal your nerves while you prepare for that big purchase. Third Floor: Lingerie, hosiery and unusual socks – including Agent Provocateur and more designer duds. Fourth Floor: Even more designer duds. And another restaurant. The store also has its own hairdresser and a travel agent, as well as the now standard wedding gift registry and personal shoppers that Selfridges probably invented. 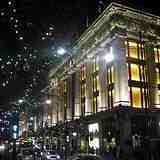 There are lots of good reasons why Selfridges was named the world's best department store in 2010. And even if you hate shopping you'll still appreciate Selfridges for livening up your journey down Oxford Street with their truly art-tastic window decorations that aren't just for Christmas but are done to a 'T' all year.